Healthy Hotties: An Intro to Eating Sea Vegetables: My Top 5, How to, and Why! An Intro to Eating Sea Vegetables: My Top 5, How to, and Why! Eating seaweeds might sound a bit unpleasant to those new to the idea, but as Healthy Hotties we know what the Japanese have known for centuries - sea vegetables are alkalinizing superfoods, packed with 10-20 times more nutrients than land plants (though technically they are not plants nor animals, but algae). The wide varieties of minerals are from the mineral-packed ocean waters they grow in, which simply cannot be found among most other foods. Sea vegetables have anti-inflammatory, anti-cancer (especially colon and breast cancer), anti-coagulant, anti-thrombotic, and anti-viral properties. While they have a considerate amount of other benefits, seaweeds are mostly known for their high concentrations of iodine and vitamin K, needed for optimal thyroid function and to protect our bones, prevent calcification of the arteries and to make sure our blood clots normally. You can add it to pretty much anything like salads, sautéed vegetables, brown rice and stir fries. 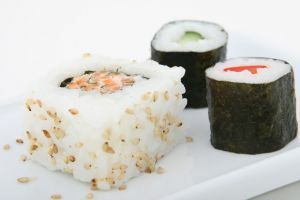 If you’ve ever had maki rolls at a Japanese restaurant then you’ve already eaten nori! The water seaweeds are soaked in becomes very nutritious and flavourful and can be used in the recipe you are making. To gain maximum flavour and nutrition, try to use the same amount of water to soak your sea vegetables as is needed for your recipe. DO NOT OVERSOAK – The longer you soak them the more important nutrients are drawn into the water and out of the vegetables. Water also clogs sea vegetables rendering them less able to absorb the flavours of the seasonings used in your recipes. Although highly nutritious by absorbing so many minerals from the ocean, seaweeds may also absorb unwanted heavy metals. Of most concern are the high arsenic levels found in some seaweeds, especially one I didn’t discuss above called hijiki. Hijiki is like arame, but stronger in flavour and higher in nutrients. It is difficult to find due to the arsenic contamination which is very dangerous to consume. If you would like to try some, be sure to get a certified organic brand such as Maine Coast Sea Vegetables Inc. The five different types of sea vegetables mentioned above are sure to get you moving in the right direction, so try to incorporate some of these wonderful mineral-dense gifts of the sea into your diet and let me know how it goes! (You can start by checking this recipe).